Do you ever compare your work to the work of other designers? Are you afraid to ask clients for money? If you are a freelance web designer, you know how difficult this lifestyle can be. From scheduling, to dealing with crazy clients, to managing your own work/life balance—there is a lot to juggle! 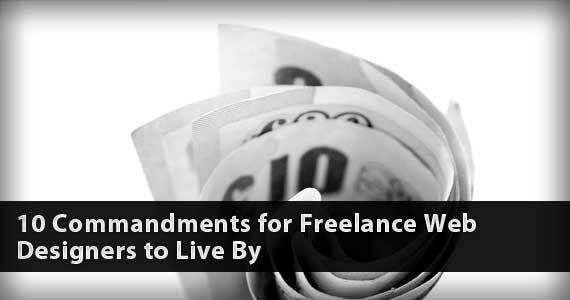 So to simplify your life a little, I am letting you in on my 10 Commandments of Freelancing that have helped me through many tough times. I hope they help you too! Whether you are just starting out or have been freelancing for a while, remember, everyone starts small. If you keep working diligently at building your freelance career and believe you can succeed, you will notice positive growth over time. Don’t ever give up! Low self confidence will impede your progress as a freelancer. Don’t let anyone ever tell you that what you do is easier than working a 9 to 5 job. Yes, you create your own schedule and there are many perks, but the mental battle can be fierce! You must constantly put yourself out there and you become vulnerable every time you submit work to a client. Will they like my work? Will they reject it and think I am not qualified? What if they don’t like it? Will I ever make a living doing this? First, remember that your work is not a direct reflection of who you are as a person. Separating your personal worth from your work is half the battle. It’s OK to make mistakes and work through them. Mistakes do not define you; they make you stronger. You do not have to be the award-winning, perfect, millionaire-making designer to provide your clients valuable services. This doesn’t mean you should stop learning and growing in your craft. But, most web designers fail to realize how MUCH they actually know because they are so busy comparing their knowledge to other successful designers instead of serving their clients. And if you have been working as a freelancer for a long time, it is easy to forget how much knowledge you have because your skills have become so commonplace to you. It is NOT common knowledge to your clients, if it was, they would not be coming to you for help! You have something to offer! This commandment ties into the last one. If you know the value you offer, you will not feel guilty about invoicing a client. Your clients are paying you for your service and time and if you gave the project your all, you deserve every penny owed to you. Procrastination is like our evil sidekick that vies for our attention. For me, it attacks when I hit an obstacle with a project. It’s much easier to check Facebook or respond to a friend’s email then to tackle an obstacle head on. To avoid procrastination, create a weekly/daily schedule and assign hourly tasks. When I create a schedule the night or week before, I know exactly what needs to be accomplished and how much time it should take. If you do not create a schedule, you will be tempted to push a project back another day and convince yourself you will have time to finish it tomorrow. Some freelancers have the opposite problem of procrastination. If you stay up late at night and take on more projects than you know you can handle, you may need a reality check. The extra stress is not healthy, even if you need the money. Your health is not worth it! If you feel like you are working too much, it may be time to raise your rates. Never underestimate what you are worth. Don’t think that no one will pay you what you are worth. When you have this mindset, you take the low-paying projects and work harder than you have to. There are plenty of clients who pay for quality work.You just have to know how to brand yourself to look like the expert that you are and market your services accordingly. If you are confident in your services, your clients will be as well. I know I am not the only one who, from time to time, stays in my PJ’s all day! Raise your hand or leave a comment if you are equally guilty! It’s way too easy for freelancers to roll out of bed and go straight to your desk. On days when I am not leaving my office, I find it productive to get ready as if I am leaving for a meeting. When you remain in your pajamas, you will stay in “sleep mode.” When you get dressed for the day, you become energized and more ready to face the day. Have you ever sat at your computer in a comatose state for more than 10 hours at a time? For health reasons it’s good to get up and walk around every hour, even if for just a few minutes. It gets your blood circulating. It’s not good to stay in a sedentary state for longer than an hour at a time. 9. Thou Shalt Say No! Remember that it is OK to say “no” to a project if it doesn’t line up with your skillset or your desired budget. You are hiring your clients just as much as they are hiring you. If you are not comfortable with a task or the nature of the work, pass on it. You will be happy you did. If you are just starting on your first few projects, you can offer free work in exchange for exposure, but most of the time it is not worth it. Clients will give you every reason to work with them for next to nothing and promise you grand exposure even though their website doesn’t even have enough traffic to track. Do your research and just say no! Do you have other commandments you live by? I would love to hear more!